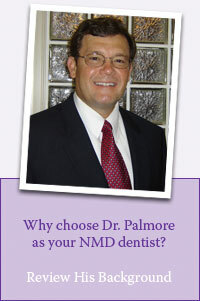 Dr. Palmore has advanced training in neuromuscular dentistry (NMD). His NMD expertise can rejuvenate oral health and reverse years of pain. His carefully designed treatment ensures enhanced or restored smiles will function properly and be comfortable for many years to come. Neuromuscular dentistry has changed how Dr. Palmore approaches your care. NMD is not a magical treatment; it is comprehensive evaluation that goes beyond the conventional, and identifies (and corrects) the basis for proper oral function and stability. His extensive training at the Las Vegas Institute for Advanced Dental Studies (LVI) signifies his commitment to developing the best therapies for his patients. With state of the art technology, Dr. Palmore and his team performs computerized jaw tracking. Electromyography measures muscle health or spasm in the head and neck. Electrosynography allows us to analyze popping or clicking, which can occur in your jaw joint and may signify a damaged or diseased joint. Furthermore, Dr. Palmore achieves relaxed muscles through the use of electrical muscle stimulation, referred to as TENS.